A gentle face wash formula for all skin types. Gently cleanses even the most delicate skin. Contains Australian bush flower essences and organic sun ripened citrus to gently cleanse and invigorate even the most delicate and mature skin. Enliven the skin with revitalising energy and invigorate the senses and soul. Organic Aloe barbadensis leaf juice, Aqua (Water), decyl glucoside, Organic glycerin, glycerin*, glyceryl caprylate*, Lobelia gibbosa essence, Lysiphyllum cunninghamii essence, Planchonia careya essence, Callistemon linearis essence, Styphelia triflora essence, Thysanotus tuberosus essence, Eucalyptus macrocarpa essence, sodium anisate*, Arnica montana flower extract, Organic Echinacea purpurea extract, Calendula officinalis extract, Olea europaea (Olive) leaf extract, Organic Simmondsia chinensis (Jojoba) seed oil, Vitis vinifera (Grape) seed oil, Organic Cyamopsis tetragonoloba (Guar) gum, Organic Cymbopogon martini (Palmarosa) oil, cetearyl alcohol*, glyceryl stearate citrate*, sodium stearoyl glutamate, sodium phytate*, xanthan gum*, Organic Citrus sinensis (Sweet Orange) fruit peel oil, Organic Citrus medica limonum (Lemon) peel oil, sodium levulinate*, citric acid*, potassium sorbate, d-limonene^, geraniol^. Gently apply to the face for a gentle morning cleanse, rinse well. 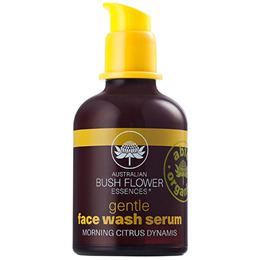 Below are reviews of Australian Bush Flowers Gentle Face Wash - Citrus - 50ml by bodykind customers. If you have tried this product we'd love to hear what you think so please leave a review.